This year is the 400th anniversary of James I’s notorious Plantation of Ulster. By the terms of the plantation, James I proposed to evict all the Irish from the province of Ulster and repopulate it with a loyal Protestant population drawn from England and Scotland. In return for their land, the planters agreed to create new settlements and homes for themselves. As a result, the plantation prompted a wave of new building: towns, villages, churches, houses and castles. Leading in this process of reconstruction were several of the city companies, who saw the possibility of huge profits in this political venture. 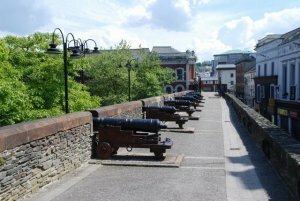 By a charter of 1613, the City of London was made responsible for the town of Derry, which henceforth became known as Londonderry. With its walls, public buildings and two cathedrals, this city is an outstanding architectural memorial to the plantation. 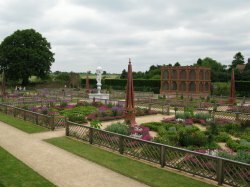 Over the summer of 1575, Elizabeth I paid a long visit to Kenilworth Castle, where she was lavishly entertained by her favourite Robert Dudley, Earl of Leicester. The garden created for this occasion was described in a letter by a certain Robert Langham. Using this description, English Heritage has recreated the 16th-century castle garden with its central marble fountain and aviary. The claims of this garden to historic authenticity have been called into question by some authorities, but the result is fascinating to see. So, too, are the extraordinary ruins of the great castle here, which was ruined. The 500th anniversary of the accession of Henry VIII to the throne has been much publicised this year. Although most of the Tudor royal apartments and gardens at Hampton Court have long since been swept away, sufficient survives to give a vivid impression of the palace familiar to this celebrated English king. To coincide with the anniversary, Hampton Court is staging an exhibition on the ‘Young Henry VIII‘. 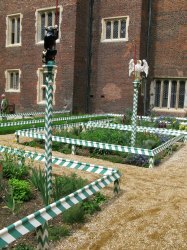 A Tudor formal garden has been recreated in one courtyard (based on a 16th-century depiction of the royal garden at Whitehall). The outer court has been relaid with rough paving, so, as a paved surface, it’s still possible to admire the form and grandeur of Henry VIII’s residence. 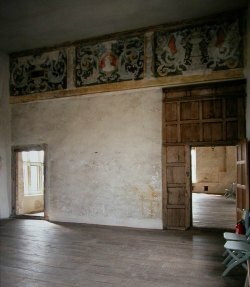 For anyone interested in seeing the only surviving royal apartment used by Henry VIII, they need to travel to rural Gloucestershire. In 1535, the owner of Acton was Anne Boleyn. The extension the king created for his royal visitors still survived intact as a farmhouse and was rediscovered only a few years ago. The interiors preserve considerable quantities of painting and panelling. Of more technical interest, there survive downstairs a series of 16th-century mason’s drawings incised into the plasterwork. Henry VIII’s greatest legacy was—for good or ill—his assault on the power and wealth of the church. As part of this process, he oversaw the closure of all English monasteries. Across the country, the architectural remains of these great institutions survive. In some cases—as at Tintern or Rievaulx—they survive as celebrated ruins; in others—such as Newstead or Forde—as houses adapted to domestic use. Thornton Abbey was one of the richest Augustinian houses in England and was intended to be a new cathedral. In the event, however, the monastery was sold off and the buildings eventually demolished. 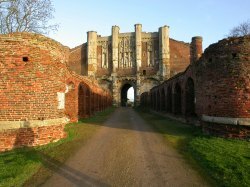 There still survives on the site, however, one of the largest monastic gatehouses ever erected in England. This spectacular but little-known monument has recently been restored by English Heritage and its interior been made properly accessible. This year is the 700th anniversary of the purchase of Alnwick by the Percy family. This great family, earls—and later dukes—of Northumberland since the late 14th century, continues to occupy the castle. The present buildings are a magnificent combination of medieval and 19th-century architecture. Their principal interiors, adapted in the 19th century, have been in the process of restoration over the last few years. Besides the castle, Alnwick preserves two monastic buildings in its wider estate: the impressive gatehouse of Alnwick Priory and the charming enclosed site of Hulne Priory. The rescue of Dumfries House and its contents by the Prince of Wales was widely reported in 2007. This outstanding 18th-century house, which is still in the process of restoration, may now be visited by the public. Built as the country seat of Sir Robert Walpole, Houghton has long been acknowledged both for its architecture and its collections as one of the outstanding 18th-century houses of Britain. The Marquess of Cholmondeley has been restoring the historic landscape of the house and also introduced modern sculpture and art installations to it. As part of this process, the great walled garden has also been impressively restored. 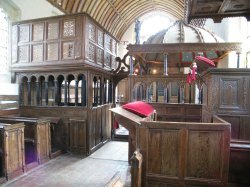 The 15th-century chapel beside the great house at Rycote was used for numerous royal visits by Elizabeth I, James I and Charles I. To accommodate its royal visitors, an exceptionally fine collection of stalls was created out of the medieval furnishings. The chapel in the guardianship of the state but money has been provided for a sensitive restoration of the building. This has culminated with the installation of a new organ. 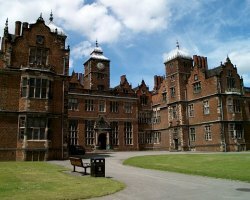 In July this year, Aston Hall has been reopened after a major restoration project undertaken by Birmingham City Council. The house was begun in 1618 by Sir Thomas Holte, a local landowner, and was described soon afterwards as ‘A noble fabric which for beauty and state much exceedeth anything in these parts’.